Thank you for visiting the Government Tyranny and Corruption News page. There seems to be no lack of news and information that I will be adding to this page in the future. I only hope that I can keep up with it all. Please check back again often. If you have news about government tyranny and corruption please use the form below to submit it and be sure to include the source information for independent verification. Thank you. The former head of Chicago's red light camera program was arrested Wednesday in a $2 million bribery scandal and charged by federal prosecutors with plotting to steer the contract to Redflex Traffic Systems before the first ticket was ever issued in 2003. John Bills, the former transportation official who managed the red light contract until 2011, coached Redflex officials in a series of clandestine meetings and helped them grow their program into the largest in the country, authorities alleged. In return, they said, Bills received hundreds of thousands of dollars in cash spent on a vacation home, a boat and a Mercedes convertible, along with dozens of trips and a condominium near the company's Arizona headquarters. The single bribery charge against Bills puts him at the center of sweeping allegations in a scandal that by size alone ranks among the largest in Chicago's notorious history of corruption. 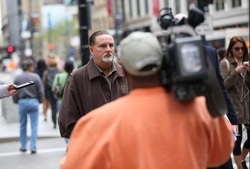 The Tribune first disclosed the questionable relationship between Bills and Redflex in the fall of 2012, revealing a scandal that has shaken the foundation of the company and its Australian parent, Redflex Holdings Ltd.
Just a few weeks ago Jonathan Fleming was finally let out of prison after 25 years of hell for doing a crime he never committed. This week I interviewed on my national radio show the hero investigators Kim Anklin and Bob Rahn of Management Resources LTD of NY. They were the determined and brave ones who took this case on when the family approached them. They told me, though somewhat cynical at the start and not sure of Jonathan’s guilt or not they committed to find the truth. The more they dug, the more they exposed shoddy police and prosecution against Jonathan. The real estate giant chaired by Richard Blum, the husband of California Sen. Dianne Feinstein, is cashing in on a new federal crisis. Just a few years after the firm now known as CBRE Group collected more than $108 million from a contract to help the FDIC sell foreclosed properties, the company owned in part by Blum is selling off old post offices under an exclusive contract with the financially struggling U.S. Postal Service, records show. Officials for the Postal Service, Feinstein’s office and Blum’s company say the contract signed in 2011 with CBRE involved no political influence and was awarded to CBRE after a competitive process that involved six other firms. Ironically, Feinstein tried unsuccessfully to block the sale of the post offices before her husband’s firm won the contract. And the Postal Service says the decision to sell the buildings, some of them designated as historic sites or located in prime downtown locations, was purely financial. Nonetheless, the deal is the latest example of how relatives of powerful politicians and federal officials routinely benefit from the largesse of a government overseen or run by their loved ones. Earlier this week, the Energy Department acknowledged senior officials have frequently arranged for their children or other relatives to win summer jobs or plum internships despite rules inside the department against nepotism. Several members of Congress have faced controversy over the years for hiring each other’s spouses on congressional or political action committee payrolls or accepting preferential rates on mortgages. Senate Republican Leader Mitch McConnell endured years of scrutiny when his wife Elaine Chao collected a Cabinet-level salary as George W. Bush’s labor secretary. And House Minority Leader Nancy Pelosi faced numerous questions after revelations her husband was offered a preferred stock deal from the VISA credit card giant around the same time the company lobbied her office on legislation. Paul Pelosi also has been involved in projects that benefited from federal earmarks sponsored by his wife. Blum and Feinstein, a California Democrat and one of the Senate’s most powerful members as chairwoman of the Intelligence Committee, likewise have faced questions about overlapping business interests previously. In late 2008, the real estate firm then-known as CB Richard Ellis senate-husbands-firm-cashes-in-on-crisis/?page=all”>won a contract from FDIC to sell off properties the government inherited during the mortgage crisis at generous commission rates that ran as high as 8 percent to 30 percent. Around the same time, Feinstein took the unusual action of introducing legislation to route $25 billion in taxpayer money to the agency that had just awarded the contract. Ethics experts raised concerns about the appearance of a conflict of interest, though all parties involved denied any wrongdoing. A subsequent review by FDIC’s internal watchdog found no irregularities in the real estate firm’s work for the FDIC and declared that it charged the government fair prices. But the 2012 inspector general’s report also divulged just how handsomely CB Richard Ellis and its chairman of the board were rewarded: the firm between 2009 and 2011 collected a whopping $108,319,000 in fees and compensation under the deal, the report showed. Blum is a successful businessman and investor with sweeping financial connections. He serves on the board of regents for the University of California and his investment firm Blum Capital has large portfolio that includes a stake in CBRE. The real estate giant says Blum serves as its chairman of the board but does not have day-to-day executive duties and is not involved in federal contract decisions. Feinstein’s 2012 financial disclosure report filed in May shows her husband’s stake in CBRE is worth $250,000 to $500,000 and earned the couple at least $100,000 to $1 million. The forms describe lawmakers’ assets in broad ranges. After the success of the FDIC contract, CBRE bid and landed the business to sell 42 old post offices for the Postal Service, which has had a relationship with CBRE dating back to 1997. The value of those properties, which range from a central Los Angeles location valued at $8.3 million to a Shawnee, Okla., office worth about $680,000, reaches into the tens of millions of dollars. The real estate firm, which is a Fortune 500 company with 37,000 worldwide employees, stands to earn significant money from each sale. The Postal Service lost $15.9 billion last year and is liquidating the buildings in an effort to raise cash. Brennan, the Postal spokeswoman, said the contract to sell the post offices was competed between seven different firms and CBRE was selected because it had the “overall best organization, capability and experience.” She also noted the company has extensive experience in federal real estate, and has worked closely with the General Services Administration previously. Feinstein’s office stressed she co-sponsored legislation that would have halted the sale of the post offices before the contract was awarded, evidence it said that the senator and her husband keep their business matters separate.